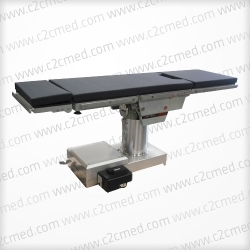 The Skytron 5000/5001 surgical tables are extremely versatile general purpose tables, designed specifically for today’s modern operating rooms. The Skytron 5000/5001 surgical tables are extremely versatile general purpose tables, designed specifically for today’s modern operating rooms. 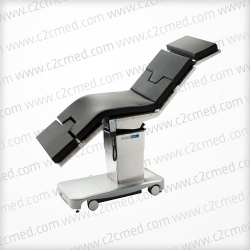 These tables offer both the Surgeon and Anesthesiologist a greatly improved standard of stability as well as improved patient positioning. An automatic locking system ensures a totally stable work surface is maintained for a wide variety of procedures. The hand controls allow the Anesthesiologist to work from either end of the table. Both the 5000 Split Leg version and the 5001 with it’s solid leg section offer head to toe radiolucent access for ease of use with a C-arm. 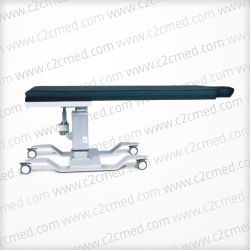 The base of the table has been designed to have a low profile for extra C-arm access. The outboard floor locks located at the head end offer superior stability when performing surgery on larger patients. The 5001 features a powered leg section which is operated via the hand control. Conversely, the 5000 model with the split leg feature requires the legs to be raised and lowered manually. 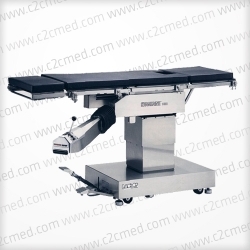 Both models can be upgraded to add an x-ray top providing unobstructed passage of x-ray film cassettes up to 14” x 17”.